Baltimore County police sent a fax and teletype message to the New York Police department. 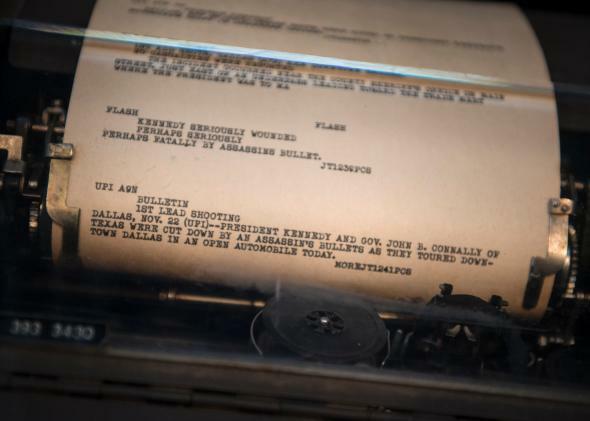 Teletype machines, like this one detailing the assassination of President John F. Kennedy, are now on display in museums like the Newseum. Two New York police officers were shot and killed on Saturday in Brooklyn by Ismaaiyl Brinsley, who is believed to have traveled from the Baltimore County area that day after shooting his ex-gilfriend around 5:45 a.m. Baltimore County Police warned the NYPD that Brinsley’s cellphone had been traced to Brooklyn, but not in time to prevent the shootings. The Baltimore County Police and the New York Police Department are inconsistent in their reporting about the exact time that Baltimore alerted New York to the suspect’s potential presence in Brooklyn. This discrepancy suggests that the use of outdated communication technology—fax machines and teleprinters—in these exhanges may be significant. New York City Police Commissioner Bill Bratton said in a press conference Saturday that the NYPD received a faxed wanted poster from Baltimore County Police at 2:45 p.m. Baltimore County Police said in a statement Saturday that they called the 70th Precinct in New York at 2:10 p.m. and also faxed the wanted poster at that time. The officers who were killed were from the 84th Precinct, but had been dispatched to the area the 79th precinct patrols to assist in a community violence reduction initiative. The Baltimore County police also said that at 2:50 p.m., right as the two police officers were being murdered, they sent the information from the wanted posted to the NYPD’s “real-time crime center—essentially, a data warehouse” in the form of a teletype. Teletypes, also known as teleprinters, are typewriters that can independently type out messages sent over non-switched telephone circuits, the public telephone network, radio, or microwave links. They were popular for remote communication before fax machines and the rise of the Internet, and their use has declined since the 1980s. For example, the Teletype Corp. made its last teleprinter unit, the Teletype Dataspeed 40, which included a CRT monitor and a high-speed printer terminal, in 1979. The Twitterverse quickly started discussing the old-skool technology and speculating about whether its use could have slowed communications.